Arvind Subramanian: What saved the rupee? 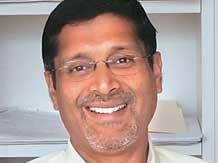 US-based economist Arvind Subramanian took charge on Thursday as chief economic advisor (CEA) in the finance ministry. The Appointments Committee of the Cabinet quietly approved his appointment earlier. There had been speculation that the government wanted to consider more candidates for the post. A former International Monetary Fund economist, like Reserve Bank of India (RBI) Governor Raghuram Rajan (who is also his predecessor as CEA), his key task will be to work out a new monetary policy framework in which the government will set the inflation target, to be implemented by a policy panel of the central bank. “For any economy like India, the two big things are macro economic stability and, of course, creating conditions for rapid investment and growth. While creating opportunity for all segments of Indian society, no one should be left out of this process,” Subramanian told reporters after taking charge. The post has been vacant for more than a year. The earlier government didn’t appoint a successor to Rajan when he became RBI chief in September last year. “It is an absolute honour and privilege to come at this time, a time of great hope and dynamism for the economy, to serve in the government that has mandate for a reform and change,” Subramanian said at a media briefing called in the name of Finance Minister Arun Jaitley on Thursday evening. He heads a team who are to bring out the government’s annual Economic Survey during the Budget session (due next in February 2015), and the Mid-Year Analysis of the economy in the Winter Session of Parliament in December. The challenge before him will be to defend polices and actions of the government, some of which he's opposed earlier, such as India’s stand at the World Trade Organization (WTO). He had also criticised the Budget for 2014-15, tabled by Jaitley in July, for undue optimism on revenue estimates. Subramanian has written on India, growth, trade, development, institutions, aid, climate change, oil, intellectual property, the WTO, China, and Africa. As CEA, his job will be to monitor macroeconomic trends and policy issues, and give his prescription on various issues from growth to inflation. The National Democratic Alliance government’s first Economic Survey, in July, was issued without a CEA. Subramanian was considered a front runner for the post when the new government came to power. However, doubts were raised when the prime minister reportedly asked the finance ministry to consider more names for the post. The ministry said he had been “appointed for a period of three years on a contract basis in the pay scale of Rs 80,000 (fixed) from the date of appointment or till superannuation, whichever is earlier”. Subramanian has served as a senior fellow at the Peterson Institute for International Economics and at the Center for Global Development, US. He has worked at the research department of the IMF (1992-2013) and GATT (1988-1992) and taught at Harvard University's Kennedy School of Government and the School for Advanced International Studies at Johns Hopkins University.